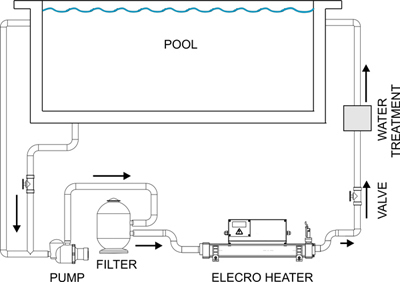 Easy to install and of an enduring, sturdy build, the Vulcan Elecro analogue pool heater is a no nonsense, reliable heater available with either titanium or incoloy heating elements (titanium models make this product suitable for use in salt water pools). 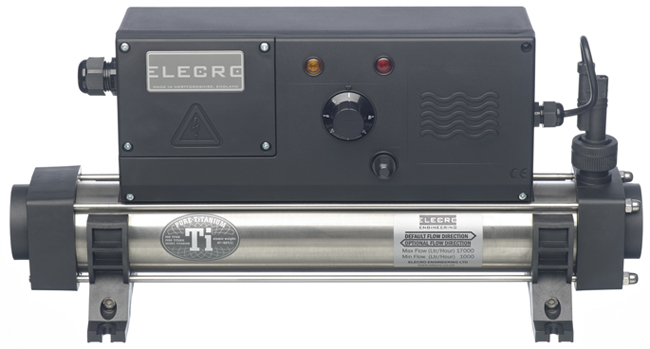 Supported by safety and equipment protection (thanks to a reversible, steadfast flow switch) as well as a thermal cut out that protects against over-temperature, the Vulcan Elecro analogue pool heater is worry free and endlessly trustworthy. Swivel feet support mean that this Elecro pool heater can be rotated to permit either wall or floor mounting, whilst a thermostat dial positioned on the front of the heater also means that you can control the temperature on your Elecro pool heater with simplicity and ease. Vulcan Elecro digital pool heaters benefit from the same specifications that make the analogue model so fantastic, but with the added efficiency of an accommodating digital display. Featuring indicator lights, an LCD display and a keypad with which to input your desired swimming pool temperature, the Elecro digital pool heater provides easily achievable accuracy.